Staff Survey 2019 – which gives you the chance to feedback about your experience of working here – launches on Monday, 4 March. Our people are our most valued asset and we want to ensure that you are satisfied with working here at the University, so we need to know what you think in order to make working here the best possible experience. 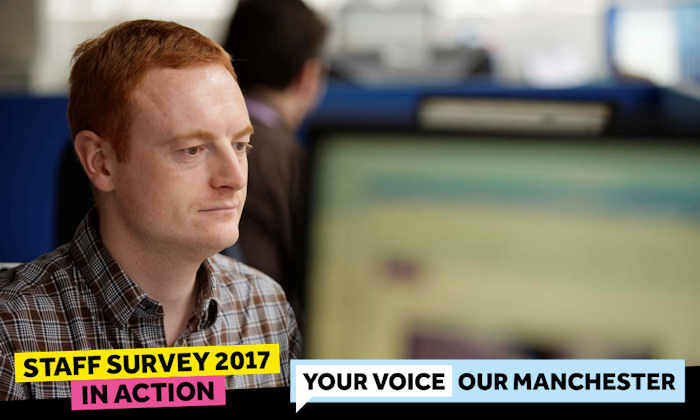 Our last Staff Survey, in 2017, resulted in actions being taken right across campus to improve your working life. These include a more transparent way of demonstrating how the budget is used in the Division of Communications and Marketing. Feedback from the Staff Survey 2017 suggested that staff were unsure about how the Division’s relatively modest training and development budget was allocated to individuals and teams. As a result, the Division’s Management Team has worked with colleagues to develop a more transparent way of demonstrating how the budget is used, whilst still retaining confidentiality about the kind of training and development individuals are undertaking where appropriate. Everyone in the Division has an annual Professional and Development Review (P&DR) at which training and development is discussed in detail. Managers and individuals come to an agreement on what kind of training and development which is being recommended. These recommendations are then considered at Management Team meetings where joint decisions are made about the kind of training and development should be funded from the Division’s budget. Managers are also encouraged to discuss the kind of training on offer from the Staff Learning and Development team like coaching and mentoring. In some cases, common themes emerge across the Division and where this happens every effort is made to develop and deliver workshop style training sessions where more people can participate. Some of these sessions have also been opened up to communications and marketing colleagues working in other parts of the University, providing great opportunities to learn new skills and also network with colleagues. Staff Survey 2019 launches on Monday, 4 March and runs until Monday, 8 April. You will receive an email or, if you don’t work at a computer, be given the chance to fill in the Staff Survey form. It only takes around 15 minutes to complete, and you can be sure that all the information you supply will be anonymous and treated in strictest confidence. This is because the Staff Survey 2019 is being administered on the University’s behalf by an external company, Capita. The survey results will be published in June.